What Is VA Form 21-0845? VA Form 21-0845, Authorization To Disclose Personal Information To a Third Party is a form is used when a veteran wants to give the Department of Veterans Affairs (VA) the permission to release their personal information to a third party. The VA is prohibited by law from disclosing any information considered confidential or healthcare-related. This means that when a family member or any other person wants to act on behalf of the veteran, they are often unable to access any of the information kept by the VA. By submitting the VA 21-0845, the veteran gives the VA permission to release their information to the third party specified in the form. An up-to-date VA Form 21-0845 fillable version was released on September 1, 2016, and is available for digital filing and download below or can be found through the VA forms website. If the VA has determined that the veteran cannot manage their own affairs, a VA-appointed fiduciary may sign the authorization for them. How To Fill Out Va Form 21-0845? Where To Mail Va Form 21-0845? permitted, including release for a purpose compatible with the purpose for which it was collected. VA has already acted based on your permission. of birth and the veteran's service number, if applicable. In this section provide the beneficiary/claimant's identification information. applies and fill in dates, if applicable. disclose federal tax information to third parties. information provided in Item 13.
be asked each time your designated third party contacts our office. Where Do I Send My Completed Form? VA Form 21-0845 on file with VA at a time. 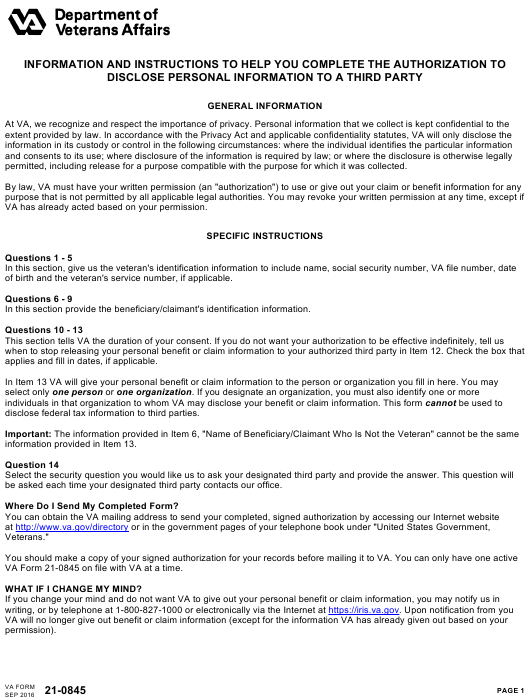 VA purposes, nor can VA accept this form from any beneficiary recognized as incompetent for VA purposes. NOTE: You can either complete the form online or by hand. Please print the information requested in ink, neatly, and legibly to help process the form. 13. VA IS AUTHORIZED TO DISCLOSE THE INFORMATION AS SPECIFIED ABOVE TO THE PERSON OR ORGANIZATION LISTED BELOW. NOTE: IF AUTHORIZATION IS FOR AN ORGANIZATION, PLEASE PROVIDE THE FIRST AND LAST NAME OF THE ORGANIZATION'S REPRESENTATIVE. 14. SPECIFY THE SECURITY QUESTION YOU WANT USED WHEN VERIFYING THE IDENTITY OF YOUR DESIGNATED THIRD PARTY. CHECK ONLY ONE SECURITY QUESTION BOX IN 14A AND PROVIDE THE ANSWER IN 14B. I CERTIFY THAT the statements on this form are true and correct to the best of my knowledge and belief. provide his or her SSN unless the disclosure of the SSN is required by Federal Statute of law in effect prior to January 1, 1975, and still in effect. instructions, find the information, and complete this form. VA cannot conduct or sponsor a collection of information unless a valid OMB control number is displayed. at www.reginfo.gov/public/do/PRAMain. If desired, you can call 1-800-827-1000 to get information on where to send comments or suggestions about this form. Per VA rules, only one third party elected through the VA 21-0845 is valid at a time. If a new form is received, the previous authorization will be revoked automatically. General filing instructions are provided on the first page of the form. Detailed instructions for completing VA Form 21-0845 are provided below. Filling out the VA Form 21-0845 starts with providing the veteran's identifying information in Section I. The veteran's name, social security number, their VA file number, date of birth and service number are entered in Blocks 1 through 5. Section II is for providing the identifying information of the beneficiary or claimant in Blocks 6 through 9. The required information includes their name, address, phone number, and email address. Section III tells the VA about the duration of the veteran's consent and the contact information of the authorized third party. Block 10 is for specifying the extent of information which may be released to the third party. The information authorized for release can be unlimited or limited, as specified by the veteran. The desired limits must be specified in Block 11. If the veteran does not want the authorization to be valid indefinitely, they must provide an end date for the authorization. Block 13 identifies the person or organization to whom the VA may disclose the veteran's personal claim information. Only one person or organization may be selected. Block 14 is for choosing a security question that the VA will ask the designated third party. This question will be asked each time the designee contacts the VA office for information. The answer to the security question should be provided in Block 14b. Section IV is for the declaration of intent. The veteran must sign and date the form in Blocks 15a and 15b to certify that the statements on this form are true and correct. The VA Form 21-0845 must be sent to one of the 1926 VA facilities. Mailing addresses can be obtained by accessing the VA website or in the government pages of the telephone book under "United States Government, Veterans."